If you visit high latitude north or south of the equator and go out when the sun goes down, you might see something that you’ve never seen in other areas of the world. You might find striking bluish-white color, like the color of lightning, appears up high in the sky but this one is different from the aurora. This is what people call Noctilucent cloud, a form of cloud that exists up to 85 kilometers high in the atmosphere. Unlike normal clouds, this one is made of ice crystals that formed around tiny dust particles in the cold temperature of the altitude. 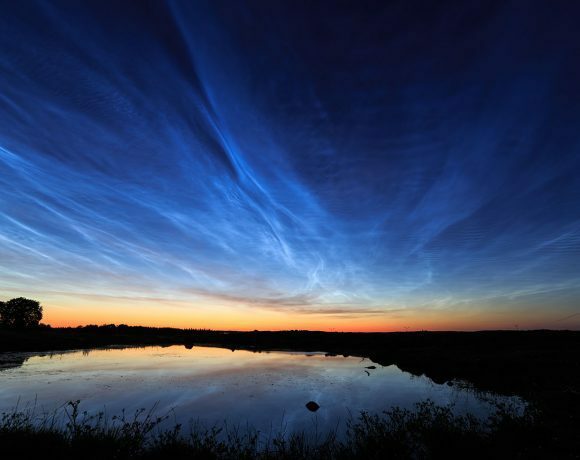 “Noctilucent” can be translated as “night shine”, because this kind of cloud can only be seen in the darker times of the day when the sun has gone down. Actually, the cloud always exists up in the sky, but it can’t be seen in the day because of the brightness of the sun. When the sun sets, the angle is right and the sunshine will illuminate the cloud, making the noctilucent cloud appear more visible to us. That’s why, even in the deep twilight we can still see the wispy formation of noctilucent clouds. The first recorded sighting of noctilucent cloud was at the year 1885, two years after mount Krakatoa eruption. That’s why this phenomenon is often linked with the great eruption. However, there is still no scientific prove linking both natural phenomena, although nobody has proven that there is no link also. It was Otto Jesse, who was the first human being to ever took photograph of the clouds and coined the term ‘noctilucent cloud’. Not only that, the German scientist also extensively study the unusual sunset phenomenon. Otto Jesse proved that the ‘unusual’ clouds indeed occurred first in 1885. Many other following studies were conducted to learn more about the ‘new’ phenomenon, but most of them only limited to ground-based observation. Scientists first approached the clouds formation in 1960s by direct rocket measurements. In 1972, noctilucent clouds were first detected from space by OGO-6 satellite. And in late 1980s, scientists first learned about the distribution of the clouds formation. Aeronomy of Ice in the Mesosphere (AIM) satellite that was launched on April 25 2007 was the first satellite dedicated to study about noctilucent clouds. The images taken by AIM satellite showed that the shape of noctilucent clouds were similar to normal tropospheric clouds. Some scientists tried to prove whether the Krakatoa eruption is the cause of the appearance of the cloud in 1920. But the result of the study proved negative, the currently known as the highest cloud formation on earth was not the result of volcanic activity, while further researches may suggest so. Actually, the appearance of this phenomena is pretty frequent, far more frequent than any volcanic activities on earth. After proving that it has no correlation with volcanic activities, scientists have tried to study the cloud formation using air balloons, rockets, and even satellites. Apparently, although the appearance is pretty common, this kind of cloud require some specific ingredients to form. In addition to very cold temperature, this cloud need some water vapor and dust to make the ice formation. 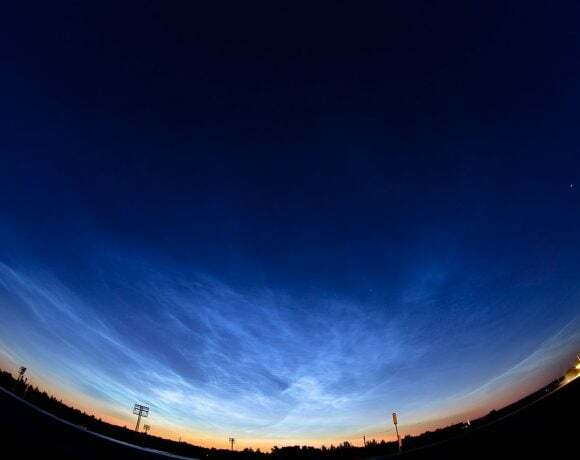 Scientists have no idea where it can collect water vapor and ice in such high altitude, but some suggest that noctilucent cloud usually gets it from micro meteors. 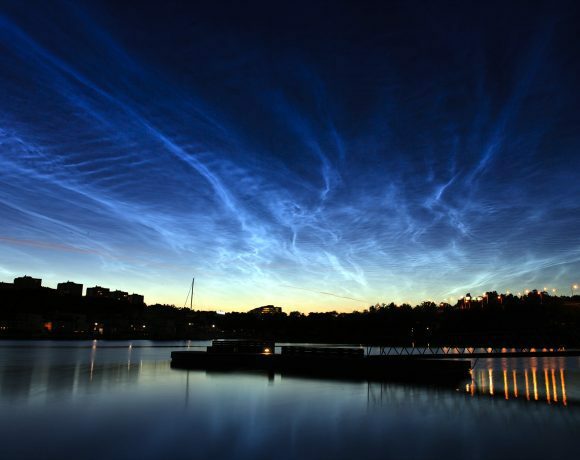 Different from ordinary clouds in lower altitudes, noctilucent cloud may form directly from water particle without any nuclei. 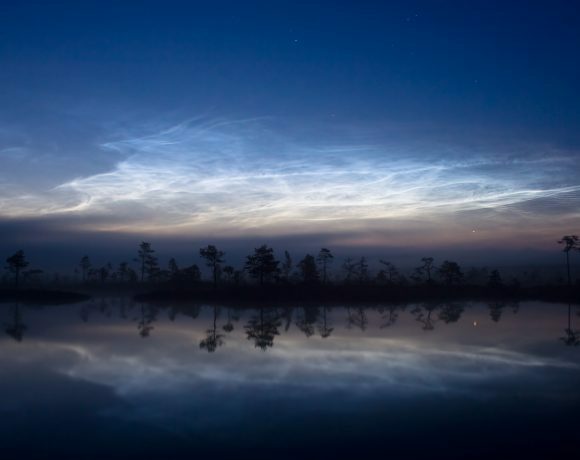 That’s why, sometimes the exhaust of space shuttles, that emit water vapor after the detachment of Solid Rocket Booster, can generate noctilucent clouds. The prove is in the year of 2014, a formation of noctilucent clouds appeared above Orlando after the lifting off of Falcon 9. Naturally, the clouds are colorless or pale blue, although sometimes red and green may also colorize it. The natural phenomenon appears best when the sun is usually at 6 to 16 degrees below the horizon, and appears clearer in deep twilight between sunrise and sunset. Although the natural phenomenon occurs pretty frequently in the northern and southern part of the world, actually there are times when the occurrence is more often. It is usually at the mid-summer time whether it is in the southern part of the world or northern part one. In northern hemisphere, the noctilucent cloud usually appears at the top during mid-May to mid-August, while in southern hemisphere it reaches its peak during mid-November to mid-February. Noctilucent clouds can be seen at a latitude of between 50 to 65 degrees, though sometimes it appears at lower latitudes. However, the observation of noctilucent clouds in southern hemisphere was far less than in northern hemisphere. Not only because the cloud itself appears more faintly and less frequent, but also because southern area has less population and place to observe it. Scientists who study the highest cloud formation on earth found out that the noctilucent phenomena appear more often recently than former decades. That’s why, some researchers suggest that the frequent appearance is influenced by something. As mentioned above, some predicted that the cloud formation was formed by volcanic activity, linking to its first appearance just two years after Krakatoa eruption. While some predicted that the correlation between the two phenomena was not as simple as that. The great eruption of Krakatoa volcano might have emitted some mass of gasses to the mesosphere where noctilucent cloud forms, and formed the first of its kind. The kind of gasses might vary, like methane or hydrogen. Both mentioned gasses, by some reaction may produce water particles, the ingredient of noctilucent clouds. And by that prediction, some researchers suggest that the gas emission from human activities nowadays is the cause of higher frequency of noctilucent cloud appearance. Indeed, in recent decades, the amount of gas emission from human activities has increased significantly. And on the other hand, the appearance of mesosphere cloud formation to observers below is also significantly more often. Thus, the frequent appearance of the clouds might be the signal of climate change. However, this idea is rejected by some other scientists that say the clouds are formed naturally and mainly formed by waters and dusts from micro meteors.